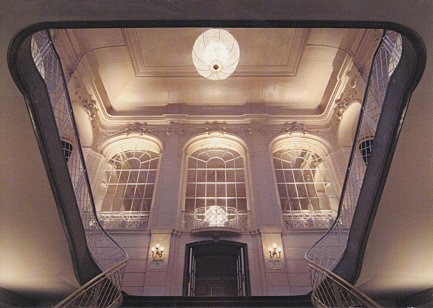 Built 1891-1892 as "Theater Unter den Linden" by Ferdinand Fellner & Hermann Helmer for Aktien-Bauverein "Unter den Linden". 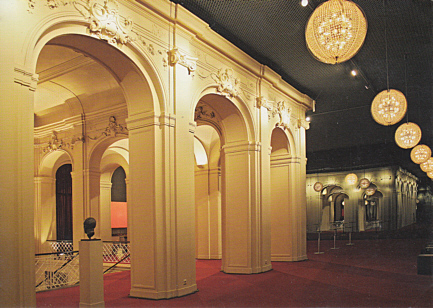 Auditorium sculptures by Theodor Friedl. 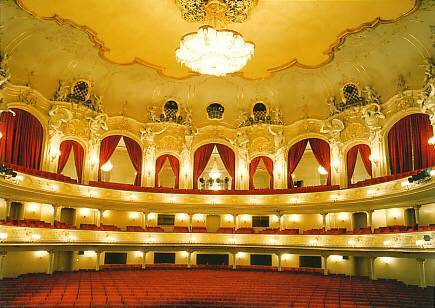 Opened 24 Sep 1892 with Adolf Ferron's operetta "Daphne" and Gaul and Haßreiter's ballet "Die Welt in Bild und Tanz". Used mainly as an operetta theatre, and for various events and balls. 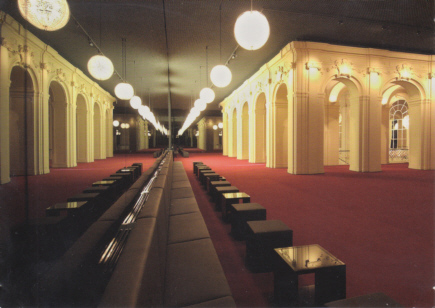 Stalls: 800 seats; balconies and various en-suite dinner rooms: ca. 1700 seats. Closed 1896 after the directors went bankrupt. 1898 minor interior renovations. 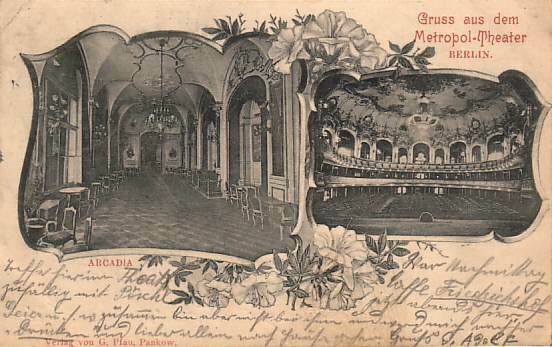 Re-opened 3 Sep 1898 as "Metropol-Theater" with Julius Freund's revue "Paradies der Frauen" (music by Julius Einödshofer and Bertrand Sänger). Subsequently used as a variety theatre. 1928 alterations and technical modernization by Alfred Grenander. Closed 1933. 1934 nationalized and renamed "Staatliches Operettentheater". Subsequently operated as part of the Nazi "Kraft durch Freude" programme. Stagehouse damaged by bombs on 7 May 1944. Subsequently provisional repair works. Façade, entrance hall, and auditorium ceiling painting destroyed by bombs on 9 Mar 1945. Feb 1946 - Dec 1947 repair works and provisional rebuildings. 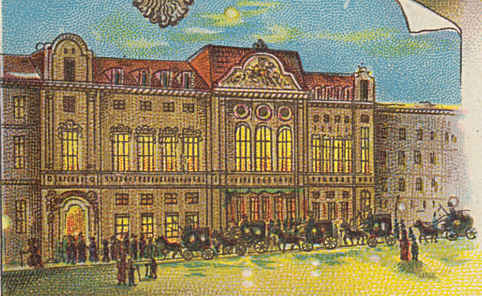 Re-opened 23 Dec 1947 as "Komische Oper" with Johann Strauß's "Die Fledermaus". Various alterations and extensions throughout the 1950s. 1965-1966 rebuilding of the exterior to modern designs and functional extensions by Architektenkollektiv Kunz Nierade. 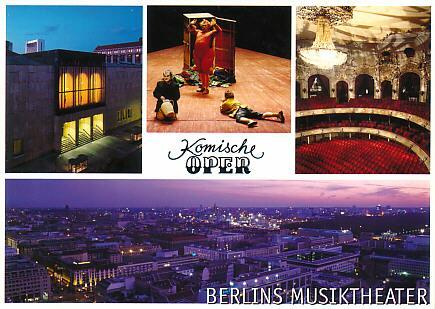 Re-opened 4 Dec 1966 with Mozart's "Don Giovanni". 1986 restoration of the auditorium. 1987 extensions. 1989 modernization of stage technology. 1270 seats. Since 1947, home to the resident "Komische Oper" opera company that was founded and directed by Walter Felsenstein until his death in 1975, spezializing on German-language productions of opera, operetta and musicals. 1966-2004 also home to a resident ballet company (first as "Tanztheater der Komischen Oper", from 1999 as "BerlinBallett - Komische Oper"). 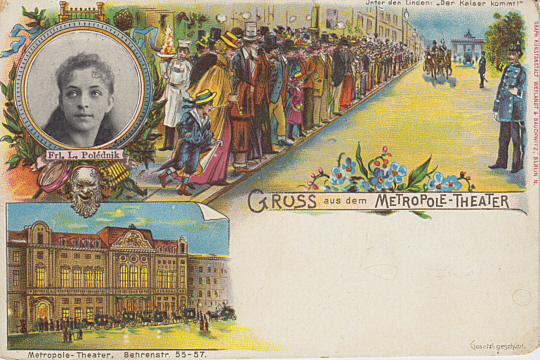 Front Text: "Gruss aus dem Metropole-Theater", above left: "Frl. L. Polédnik" (= Leopoldine Polédnik, leading ballerina), below left: "Metropole-Theater. Behrenstr. 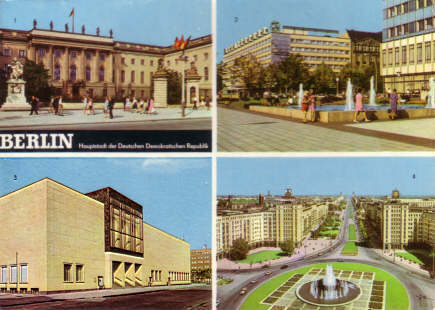 55-57", above right: "Unter den Linden. 'Der Kaiser kommt!'" 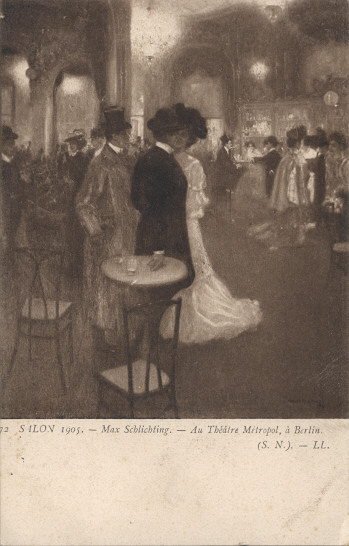 Front Text: "Gruss aus dem Metropol-Theater Berlin", caption of left picture: "Aracadia"
Front Text: "Salon 1905. - Max Schlichting. - Au Théâtre Métropol, à Berlin"
Reverse Text: "Berlin - Hauptstadt der DDR. Komische Oper", "Klimatisiert durch VEB Kombinat Luft- und Kältetechnik"
Front Text: "Berlin - Hauptstadt der Deutschen Demokratischen Republik"
Reverse Text: "1. Humboldt-Universität, 2. Interhotel 'Unter den Linden', 3. Komische Oper, 4. 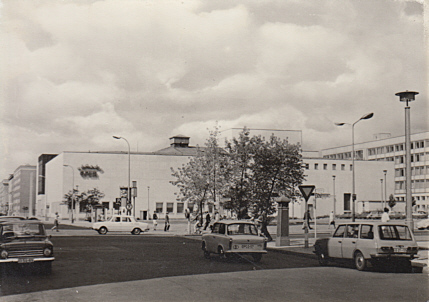 Blick vom Strausberger Platz zur Karl-Marx-Allee"
Front Text: "Komische Oper - Berlins Musiktheater"
Reverse Text: "Zuschauerraum der Komischen Oper Berlin"
Reverse Text: "Foyer der Komischen Oper Berlin"
Reverse Text: "Treppe zum Foyer der Komischen Oper Berlin"